Take a moment to recall something you’ve learned successfully in the past year. It could be something you learned for your job, preparation for a project or family vacation, a new skill you’ve developed, or an old one you decided to dust off and improve. Now reflect on this question: How did you learn what you learned? Don’t read on until you have settled on an answer to this question. Depending on the nature of what you learned, your own learning preferences, the options available to you for learning, and any number of other factors, your answer to the question above might have gone in many different directions. Perhaps you focused on the person who taught you the new information; maybe you reflected on the physical means by which the brain processes new information; you might have focused on your motivations for learning, or the features on the learning environment that helped you along the way. There is no single right answer to this exercise. The question of how people learn is a complex one, and it has occupied the attention of educational researchers for decades. In education, there are three primary traditional learning theories: behaviorism, cognitivism, and constructivism. Each of these theories provides us with an answer to the question of how people—and, in particular, how children and teens—learn. Behaviorism is focused on observable changes in behavior, which occurs as a result of repetition and practice (Pandey, 2017). Cognitivism gives more significance to the mind and is primarily concerned with changes in cognitive behavior. This theory looks at the thought process behind the actions that students take (Pandey, 2017). Constructivism, the most recently developed theory, examines the construction of knowledge through previous experiences and how students connect these experiences to the knowledge that they acquire (Pandey, 2017). Constructivism acknowledges learning as being a much more personal and social experience than the previous two learning theories. Figure 1, below, summarizes major differences in these three theories and their applications in the public library setting. In this chapter, we will examine the origins and functions of each theory, as well as how it applies to instruction in public libraries. It is important for educators, which includes librarians, to not only be aware of traditional learning theories but also to feel comfortable applying them in appropriate situations. This requires an in-depth understanding of what each learning theory states, as well as the benefits and challenges associated with each of them. While most people have a preference among these three theories, it important to note that none of the theories are completely bad or wrong. As the statistician George Box is commonly credited with saying, “All models are wrong, but some are useful.” In other words, all theories of learning have some truth to them, but no one theory can explain the full complexity of learning. Thus, instead of comparing these theories based on their accuracy, we should instead look for how each theory can inform our own practice—how is it useful to me, now, in my library, with my learners? Each theory has a role in instruction and, therefore, has a role in libraries. For librarians to successfully develop instruction around these theories, they need to understand that desired outcomes, subjects, content, and students will determine the right and wrong time to use a theory. It is also important for librarians to understand that instructing with diverse techniques to address different learning styles increases the chance that most, if not all, of your students will have the opportunity to learn in a way that fits them best. Some students learn better with lessons designed around a particular learning theory than others. This requires librarians to know and use each learning theory, regardless of their preference. Behaviorism is the oldest learning theory that we will discuss in this chapter. In the late 19th century, Ivan Pavlov began noticing that his dogs would salivate whenever he entered the room to feed them because they knew they were going to get food (McLeod, 2013). He noticed that there are some things animals do not have to be taught, and that there are some behaviors that they do have to learn, which they can do through making associations (McLeod, 2013). This discovery of so-called classical conditioning is seen as the beginning of behaviorism. Around the same time that Pavlov was conducting research on dogs, Edward Thorndike observed cats (Booth, 2011, p. 38). He watched cats while they were in boxes to observe their behavior of making “lasting associations between stimuli (pressing a bar) and a desired response (escape! ), which resulted in the development of the notion of trial and error” (Booth, 2011, p. 38). The movement truly began in 1913 when John Watson released his article “’Psychology as the Behaviorist Views It,’ which set out a number of underlying assumptions regarding methodology and behavioral analysis (McLeod, 2017). Following Pavlov’s and Watson’s discoveries, B.F. Skinner continued with the observations of animals by analyzing the learning behaviors of rats and pigeons (Booth, 2011, p. 38). In the 1950s, he developed what would be called operant conditioning, as opposed to classical conditioning, which stated that rewards and punishments are a way of teaching desired behaviors. Eventually, these ideas and practices led to preferences toward “well-controlled, instructor-focused classrooms” in which teachers were the authority and students were there to be filled with information (Booth, 2011, p. 38). The behaviorist learning theory revolves around the idea that “learning is accomplished when a proper response is demonstrated following the presentation of a specific environmental stimulus” (Ertmer & Newby, 2013, p. 48). For example, when a teacher presents an equation and the learner responds with the correct answer, “the equation is the stimulus and the proper answer is the associated response” (Ertmer & Newby, 2013, p. 48). To put it simply, learning is shown through observable behaviors such as correct answers. In addition to the focus on correct responses, behaviorists put a lot of emphasis on rewards and consequences for these behaviors, with the belief that that will affect the probability of correct responses in the future (Ertmer & Newby, 2013, p. 48). Behaviorist instruction begins with a pre-assessment for learners so that the teacher can determine where to start with the lesson (Ertmer & Newby, 2013, p. 49). Following the pre-assessment, there are no other attempts “to determine the structure of a student’s knowledge nor to assess which mental processes it is necessary for them to use” (Ertmer & Newby, 2013, p. 49). Instead of examining the learning process in that way, the focus is on the behaviors of learners when presented with problems. The duty of the teacher is to “determine which cues can elicit the desired responses” and condition learners to illustrate the correct behaviors when presented with those cues (Ertmer & Newby, 2013, p. 50). As one can probably deduce from its name, behaviorism is solely concerned with behavior and is not interested in the thinking or emotions behind that behavior (McLeod, 2017). This approach presumes that affective factors cannot be scientifically measured; therefore, they are not worth studying (McLeod, 2017). This can clearly be a weakness in this type of approach. Within our field in LIS, we have examined library anxiety, barriers to equitable access, communication in the library between patrons and librarians, and many other areas in which thoughts and emotions are extremely important to services and instruction. In addition to the lack of attention paid to emotions and thoughts, behaviorism does not offer a way to teach children to apply their learning to concepts and contexts beyond the classroom. It supplies them with the right answers, but it doesn’t instill in them the skills to be creative thinkers, lifelong learners, or problem solvers. That being said, the approach is not entirely useless. The behaviorist approach can still be applicable for instruction focused on recalling facts, remembering steps, learning rules, or generalizations (Ertmer & Newby, 2013, p. 49). For example, this approach could be useful in a public library setting in which you are trying to teach learners how to use the Dewey Decimal system to locate their books. In this situation, memorization is key to success. There isn’t much of a deeper concept involved that can be used to address other subjects in school or issues in their community when learning how to access books. Repetition, action, and practice can be an effective way for learners to gain familiarity and comfort with the Dewey Decimal system. The behaviorist approach could be applied in several ways. You could have scavenger hunts for students to be positively rewarded after locating books, or you could use apps such as Kahoot for students to participate in a game in which answering the most correct answers results in winning. This type of gamified learning is a behaviorist approach because it uses rewards to condition students to supply the correct answer when posed with a specific question. As with all the theories we will mention in this chapter, there are subjects and contexts in which this approach is not only appropriate but also useful. It is the librarian’s job to determine what they are trying to teach and what outcomes they want the patrons to walk away with. If it is something as simple as memorizing a technique, procedure, set or rules, or system, then the behaviorist approach could easily be successfully applied. Gamification—the application of game-playing elements like competition, point-scoring, and rewards to other areas of activity—incorporates elements of the behaviorist approach to learning. Some libraries have embraced gamified learning to draw in new users and improve engagement with the library’s resources and services. The Ann Arbor (MI) District Library (AADL) used gamification elements to transform its summer reading program into a summer learning program for users of all ages. The Play at AADL program incentivizes reading, exploration of the wider community and its resources, and participation in an assortment of library events and programs. Learning outcomes from these individual activities will vary. However, the overarching understanding that AADL is trying to instill through this program is that the library provides a valuable public service; in very simple terms, the library is good! The rewards that learners receive through participation in the summer learning events can function like Pavlov’s bell, forming lasting positive associations with the library. Cognitivism sprung from the acknowledgment that there was a gap in the behaviorist theory of learning, in that behaviorism did not consider or observe the thoughts that led to human behaviors (Yilmaz, 2011, p. 205). As the name suggests, cognitivism puts the focus on cognitive processes “such as thinking, problem solving, language, concept formation, and information processing” (Ertmer & Newby, 2013, p. 57). Cognitivists became more concerned with the how and why in learning as opposed to learner’s observable actions. In other words, cognitivists began studying the “mental processes” involved in learning (Yilmaz, p. 205). Many different people are credited with the creation of cognitivism as a learning theory. People such as “Edward Chase Tolman, Jean Piaget, Lev Vygotsky, Jerome Bruner, and German Gestalt were instrumental in engendering the dramatic shift from behaviorism to cognitive theories” (Yilmaz, 2011, p. 205). One of the most notable moments for the foundation of cognitivism was when Edward Tolman conducted an experiment with rats in the 1920s, by studying them finding their way through mazes to examine the idea of a “mental map” in the rats (Yilmaz, 2011, p. 205). Piaget’s argument that humans are always “building and revising ‘mental models’ (schemata)” to organize their knowledge and “categorize experiences” is also one of the major foundational ideas within the cognitivist learning theory (Booth, 2011, p .39). In cognitivism, “the primary emphasis is placed on how knowledge is acquired, processed, stored, retrieved, and activated by the learner during the different phases of the learning process” (Yilmaz, 2011, p. 205). This view places the learner as an “active participant” in an “active process” (Yilmaz, 2011, p. 205). Cognitivists care more about the knowledge and understanding of learners than their actual behaviors (Yilmaz, 2011). Cognitivist theorists pay attention to the “motivational and emotional factors” that go into learning (Booth, 2011, p. 39). This requires teachers to become more involved in their students’ learning process and look at how they are coming to the decisions and actions that they are. Therefore, it is necessary for educators to utilize a variety of learning activities such as “demonstrations, illustrative examples, and constructive feedback so that students can have mental models to embody” as opposed to just rewards and punishments (Yilmaz, 2011, p. 208). All these materials lead to learners storing the information in their memory, which “is given a prominent role in the learning process” in this theory (Ertmer & Newby, 2013, p. 59). It is the educator’s responsibility to help learners organize what they are learning and make connections to previous and future learning (Ertmer & Newby, 2013). Understanding how to apply knowledge in different contexts is called transfer. In our current society, it is likely that most educators feel that teaching for transferability in education is extremely important, but that idea had been missing in education theory before the cognitivist approach. Instead of viewing learners as empty vessels to be filled, cognitivism stresses the participation of students in their learning development, realizing that they play a much larger role in the entire learning experience; without acknowledging the mental process, we are unable to fully teach students in the way that we should. Ultimately, the most important shift from behaviorism to cognitivism was the shift from viewing behaviors as proof of learning to viewing one’s thought process as proof of learning. One way to think about this in education is how many math teachers today will not accept homework with just the right answers; they want their students to “show their work.” This isn’t done to frustrate students everywhere; it is done so that the teachers can see students’ thought processes and examine where they may be making mistakes. Examining how learners process information allows for a richer instructional experience in public libraries. This gives librarians a chance to determine what the students know and how they reach their conclusions so that the librarian can modify the lesson to address the specific thought processes of the students. Acknowledging the learners as active participants requires that librarians get to know them a little bit before the instruction begins. Librarians can open their lessons by asking learners what they know about a certain subject, and they can even follow up on answers given by learners by asking them why they believe those answers to be true. For example, if a librarian is teaching about search strategies, he or she might ask the learners at the beginning of the lesson if they think it is important to look for sources other than Google. If one learner says yes, the librarian should go further and ask the learner why. This gives the librarian a chance to get a peek at the thought process that led the student to answer that way, as opposed to just taking his or her answer and moving on. If the student just said yes because they guessed, or because they assumed that’s what the librarian wanted to hear, additional instruction may be required before moving on to a new topic. Beyond asking learners to explain their actions or thoughts, educators can also apply cognitivist theories of learning by teaching for metacognition. Defined simply, metacognition is thinking about thinking. Practicing metacognition involves monitoring one’s own thinking and learning and coming to understand oneself as a thinker and learner. A large body of research has shown that developing learners’ metacognitive skills improves learning across domains (Chick, n.d.). One way that educators can help learners develop these skills is by modeling them. For example, during a story read-aloud, a librarian might stop after reading a challenging word and say, “Hmm. I’m not sure what that word means. I’m going to look for clues in the words and pictures around it to see if I can figure it out. Can anyone help me?” Educators can also encourage metacognition by asking learners to identify questions they have or points of confusion, guiding them through “Before I thought… Now I think…” activities, teaching learners annotation skills, and incorporating reflective activities like journaling into instructional plans (Chick, n.d.). It’s not necessarily easy for children and teens—or adults—to understand or verbalize their own thought processes, which can make cognitivist teaching and learning challenging. One practice that can help people of all ages learn to better monitor their own thinking is meditation, which even very young learners can participate in with guidance. Meditation expert and author Mallika Chopra presented a session at the 2018 ALA Annual Conference focused on meditation in the library. As she explained, meditation can help young learners “create a quiet space in a complicated world” (McMullen, 2018, para. 2). Meditation can be taught in its own programs, such as the Mindful Child and Parent workshops led by librarian Jenn Carson. In these workshops, Carson leads parents and their children through “games and rituals to make them more aware of their feelings and their actions” (Carson, 2016, para. 4). Mindfulness techniques may also be incorporated into existing programming to better integrate cognitivist approaches into library instruction. For example, before you ask learners to share their work, guide them through an anxiety-reducing meditation that Chopra calls “Blow Those Butterflies Away”: have them imagine that their stomachs are full of butterflies, take a deep breath in while visualizing the butterflies, then exhale deeply to blow the butterflies out (McMullen, 2018). Constructivism, which is also known as constructionism, is focused on the belief that learning is a “social process informed by prior experience, beliefs, and individual ability” (Booth, 2011, p. 39). Variations of constructivism include radical constructivism, social constructivism, and deconstructivism; while there are these variations, the theory of constructivism operates on the belief that reality is socially constructed, created through language, and understood through narrative (Matthews, 2003). Because learning is approached with this frame of mind, constructivist educators acknowledge that “social interactions and context is necessary for learning to occur” and that peer and teacher feedback is a meaningful component to learning (Matthews, 2003, p. 57). Both cognitivism and constructivism are far less focused on rewards and punishments than behaviorism and instead try to develop and leverage intrinsic motivations in students (Matthews, 2003). Lev Vygotsky, who was mentioned in the previous section, developed the idea of the Zone of Proximal Development (ZPD), which is basically the area within which each student can learn in specific situations. A learner’s ZPD can grow or shrink depending on their learning environment and access to more-experienced individuals, which could include teachers or peers (Booth, 2011). The ZPD concept acknowledges that the magnitude and direction of learning is not always the same for all learners, even when those learners are exposed to the same materials and activities. In addition to ZPD, constructivism focuses on the concept of situated learning, which presumes that learning is affected by both cognitive and contextual factors. Constructivist educators believe that, for a learner to be able to effectively grasp and transfer knowledge, an instructor must situate the information “in a way that allows learners to interact with its real-world application” (Booth, 2011, p. 40). This means students can best learn skills and information by interacting with them. For example, instead of telling students how to be successful writers, an instructor could give students prompts they care about, model effective writing, and then let learners write. Using constructivism in this way is similar to the instructional designs used in connected learning (Chapter 7). Another important addition from constructivism is the realization that learners are independent and unique beings. Constructivists believe that “learning is individualistic and subject to ability and preference” (Booth, 2011, p. 40). Constructivism states that both the learner and the context are important to learning processes and outcomes, and, as learners, we all construct our own knowledge based on personal perceptions and experiences (Booth, 2011). Along with cognitivists, constructivists do not view children as empty vessels, but they argue that since students interpret knowledge based on their own reality, learning should be student-directed. This means that educators would alter their lesson plans, teaching styles, and content to meet children where they are in ability, stage, or interest (Matthews, 2003). This requires an instructor to get to know their learners and target their interests at their level of ability, as opposed to having a one-size-fits-all lesson. Public libraries are one of the best places for this type of learning to occur since there is less pressure on designing lessons around specific standards or curriculum and since programming can be based on student’s interests. This allows librarians to acknowledge interests among their patrons and give them multiple ways to learn about that topic. Clearly, cognitivism and constructivism share several beliefs and attitudes towards learners and the learning process. One of the biggest differences, however, is that constructivists believe that learners “create meaning as opposed to acquiring it” (Ertmer & Newby, 2013, p. 55). They believe that each learner interprets and understands the world around them based on their own unique life experiences and that there is not one universal meaning or understanding for all students (Ertmer & Newby, 2013). This major difference between cognitivism and constructivism changes the way an educator designs his or her lesson. The instructor must plan his or her lesson while understanding that “meaning is created by the learner: learning objectives are not pre-specified nor is instruction predesigned” (Ertmer & Newby, 2013, p. 58). Milwaukee children’s librarian Peter Blenski created a LEGO Challenge event that demonstrates constructivism in action (Blenski, n.d). In this program, he challenged participants to build their own desert island out of LEGO blocks. This is part of the learner-centered approach to constructivism, which builds on existing student interests and knowledge to create new understandings. Blenski also recognized that his participants were each unique independent learners, which is why he let them build their own islands however they like. After learners had built their islands, he gave them a choice to pull out a disaster card, letting them know that “whatever disaster they pull will happen to their island, so they need to find a way to fix it” (Blenski, 2017). Once again, he gave students a choice, and he let them construct their own meaning of the disaster and how to fix it. By leaving the options open, students with varying ability levels could participate in this challenge. A 10-year-old with a lot of practice and passion for engineering might build a large complex island and pull out multiple disaster cards to solve, whereas a seven-year-old with cognitive disabilities might build a much smaller and simpler island and take the challenge at their own pace. Because each learner designed something based on their own understandings and experiences and took part in something that was relevant to their own interests, they were able to develop critical thinking, engineering, and design skills that they could then transfer into other contexts. As discussed in this chapter, there are three traditional learning theories that librarians should be aware of: behaviorism, cognitivism, and constructivism. Behaviorism revolves around the belief that “learning is observable and conditioned” (Booth, 2011, p. 46). Cognitivism is based on the mindset that “learning is cognitive, structural, and internal” (Booth, 2011, p. 46). Constructionism states that “learning is social, active, and contextual” (Booth, 2011, p. 46). After examining each theory, we can understand that there are many factors that affect learning, including “memory, motivation, environment, and prior learning” (Booth, 2011, p .46). As you can see, each theory somewhat builds on the one before it, adding to our understanding of the complexities involved in the learning process. 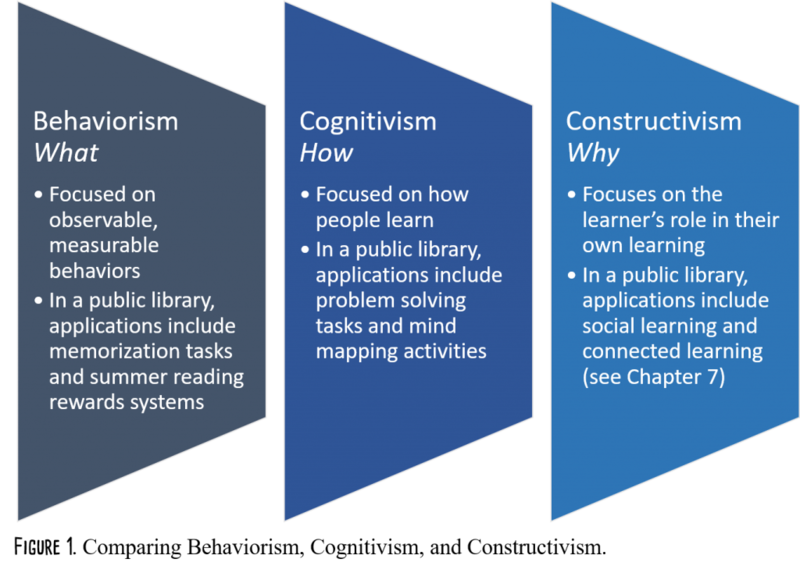 While constructivism takes the most into account when examining the learning process, behaviorism and cognitivism are not “wrong.” Each theory has a time and place to be successfully implemented in a library setting. Used appropriate, all three approaches can lead to “a better understanding” of “information literacy and critical thinking” (Johnson, 2007, p. 107). For example, the behaviorist approach can be effective when learners are presented with specific outcomes prior to the lesson (Johnson, 2007, p. 108), such as learning the Dewey Decimal system. The constructivist approach to teaching information literacy could be applied when learning outcomes allow for multiple approaches to the same task, for example having teens create an escape room in the library. All the theories are important to understand; it is up to the librarian to make them useful and effective. Booth, C. (2011). Reflective teaching, effective learning: Instructional literacy for library educators. Chicago: American Library Association. Ertmer, P. A., & Newby, T. J. (2013). Behaviorism, cognitivism, constructivism: Comparing critical features from an instructional design perspective. Performance Improvement Quarterly, 26, 43–71. Johnson, W. W. (2007). The application of learning theory to information literacy. College & Undergraduate Libraries, 14 (4), 103-120. Matthews, W. J. (2003). Constructivism in the classroom: Epistemology, history, and empirical evidence. Teacher Education Quarterly, 30 (3), 51-64. Yilmaz, K. (2011). The cognitive perspective on learning: Its theoretical underpinnings and implications for classroom practices. Clearing House, 84 (5), 204-212.